It's a clever name, isn't it? 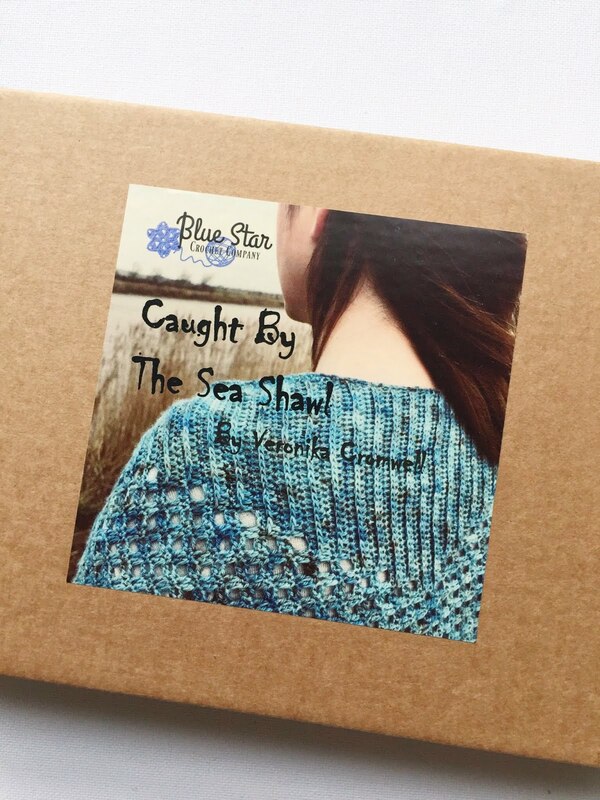 I was even MORE thrilled when they asked if I would like to be sent some of their goodies for a blog review. 'Errrrrrrrrr, yes please!' was my rather-instant reply. You see, I'd been eyeing up several of their products for a while. 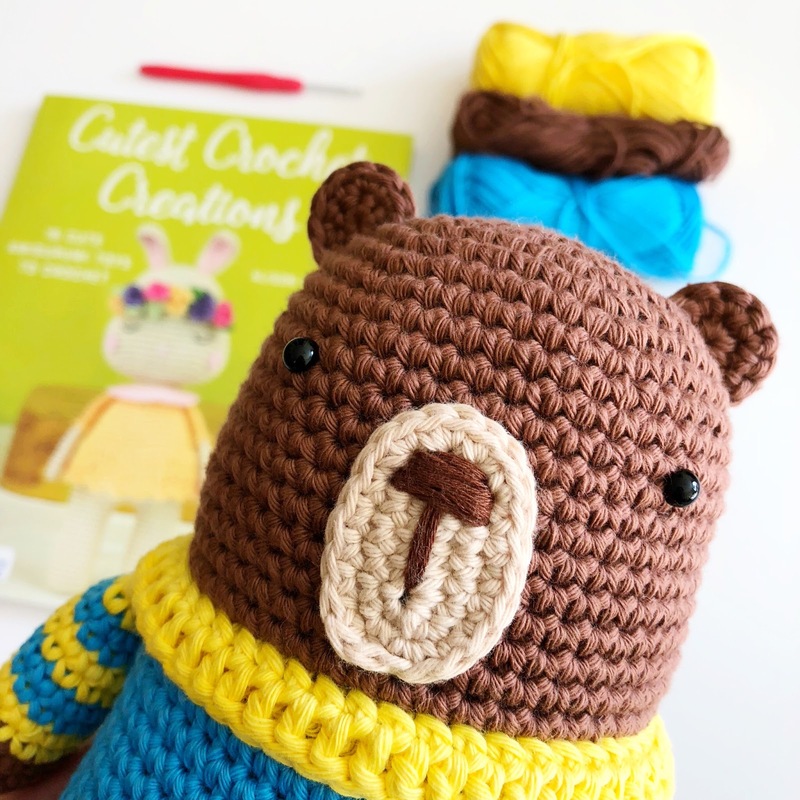 Heather is the fabulous crochet designer behind the blog, Keep Calm and Crochet On and her designs feature regularly in the UK's top crochet magazines. 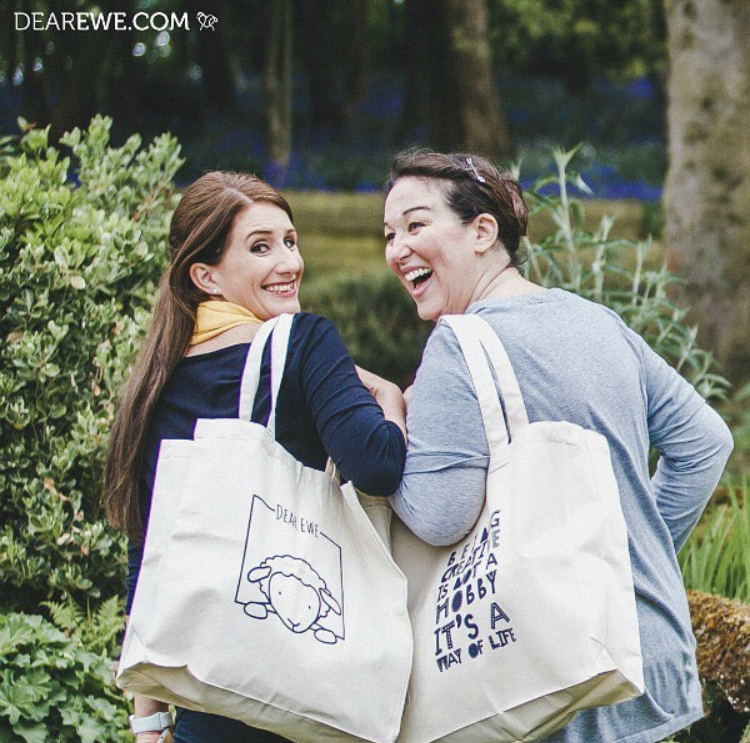 Rebecca is the talented graphic designer of Keepsakes by Rebecca and together, they are the creative team behind their new brand, Dear Ewe. We're proud to live in Stoke-on-Trent (affectionately known as The Potteries) - officially recognised as the World Capital of Ceramics, so felt strongly about using locally produced fine bone china, that is hand decorated by skilled lithographers. 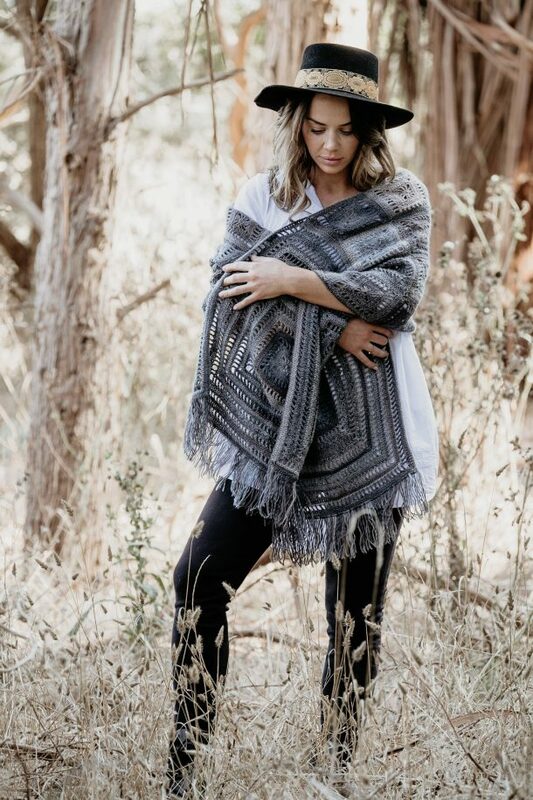 Our textiles are all hand-finished locally too - sourcing our products close to home and supporting local business owners and our local community was something we were both very keen to do. What a good thing to hear. This is a pic from their website - I wanted to show it without my creases! I LOVE the sentiment. 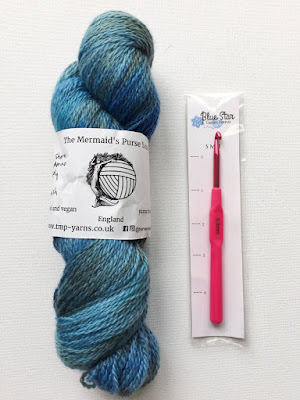 I LOVE the size (perfect for shopping - am thinking Yarndale-type-festival-binge - it will hold a tonne of purchases - see top pic). OR it will be great as a very ample-sized project bag - jumpers, blankets, cushions etc. 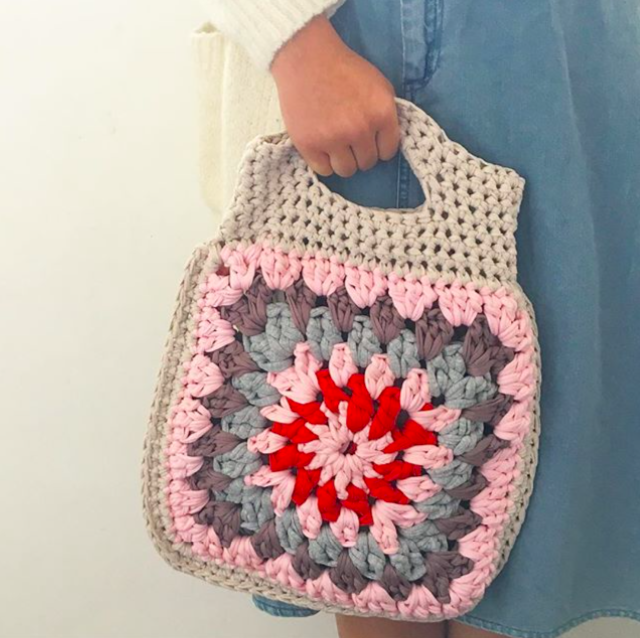 AND it's very good quality: I have plenty of project bags which are a bit on the flimsy side - this one is nice, thick cotton and will stand up on its own. All good in my book. For anyone who hasn't seen these before, they are used by us Instagrammers and Bloggers as a photo prop beside a project - they can provide a little humour to a picture and help engage the reader. What I really like is obviously the design - black and white work with every colour scheme and the text is easy to read and clear in photos. 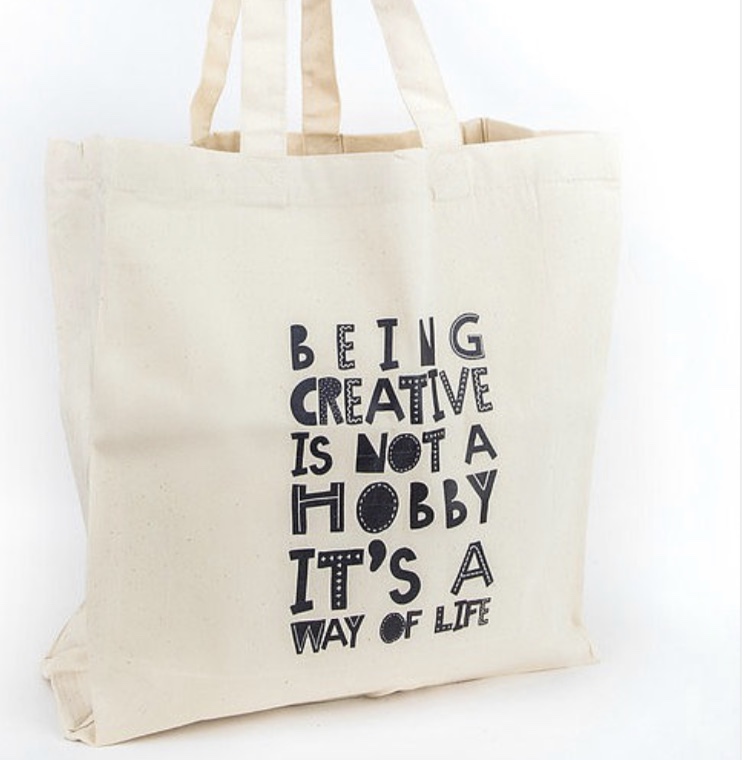 The phrases themselves are cute and relevant to modern makers. Lastly, the quality is perfect - good, thick card (so will last me a while) and EVEN better - double-sided!! What a great idea - twice the fun. Simple, sweet and very, very cute. I am already planning who to give these to, and then changing my mind because I don't want to give them away!!! Again - sweet sentiments, great design and good quality. They made me smile as soon as I opened them. It's a Granny Square Chart on a MUG! The crochet chart mug!!!!! Isn't is FAB????!!!! I seriously have no words. Design and quality are superb. There are 4 different crochet chart mugs, 4 character mugs and 4 crafter mugs to choose from. So what would be my verdict? I'm hoping you've already got the general idea - I am seriously impressed. 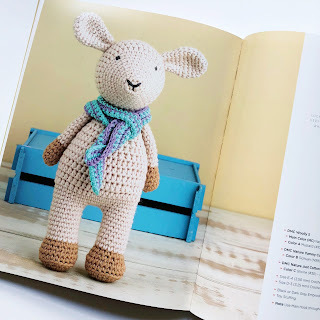 Great quality, superb design and original ideas make the Dear Ewe products something I will be buying for my crafty friends. AAAAAAND, 'cos they're super-nice and lovely, Rebecca and Heather have offered you, my lovely readers an exclusive 10% discount code to use on your order up until 24th December 2018: just use ANNABOOANDEWE at checkout! If you order before Dec 20th 2018, they'll also guarantee UK Christmas delivery, too!! 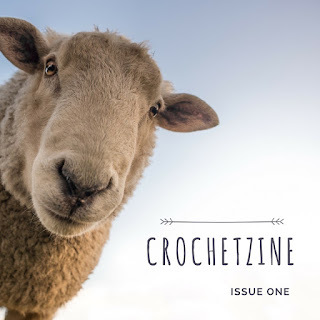 *Instagram's first crochet magazine; 12 squares of crochet loveliness delivered every month to your IG screen. These items were received as a gift in return for an honest review on my blog. All views and opinions are my own. 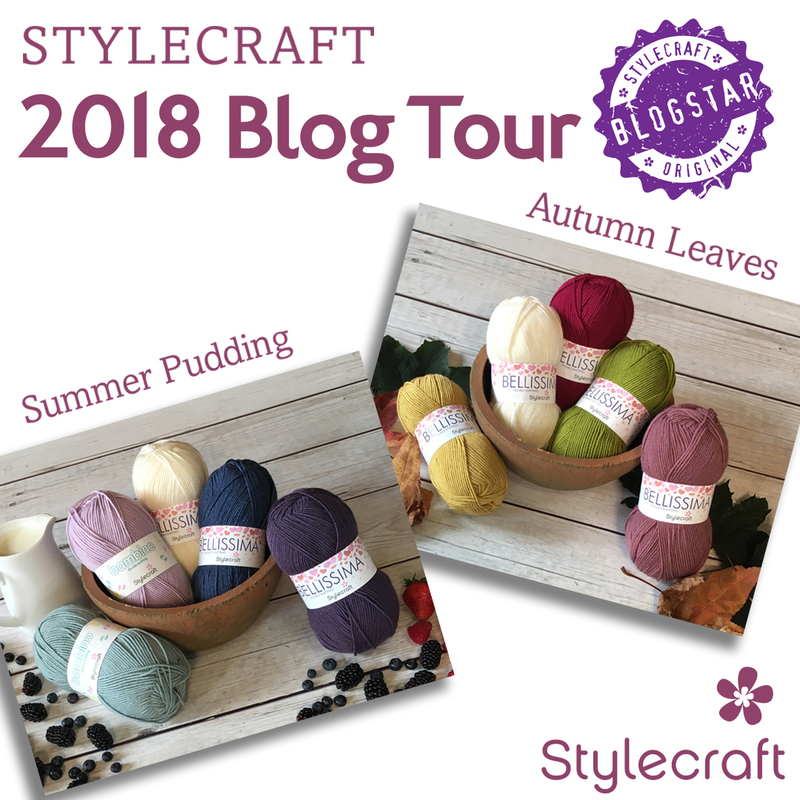 The Stylecraft Blogstars are on tour again, this time showcasing the FABULOUS Bellissima yarn. 1. Working with 2 strands of Ash Rose, make four rows of increasing c2c. 2. Working with 1 strand of Ash Rose and 1 strand of Rio Red, make four rows of increasing c2c. 3. Working with 2 strands of Rio Red make four rows of increasing c2c. 4. Working with 1 strand of Rio Red and 1 strand of Single Cream, make four rows of increasing c2c. 5. Working with 2 strands of Single Cream make three rows of increasing c2c. 6. 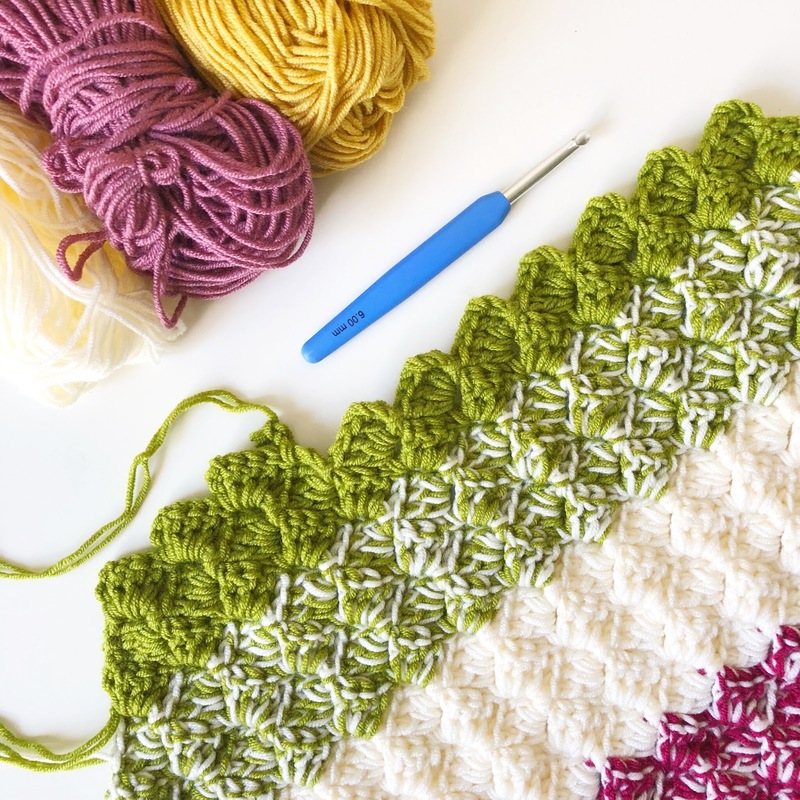 Working with 2 strands of Single Cream make two rows of decreasing c2c. 7. Working with 1 strand of Single Cream and 1 strand of Sugar Snap, make four rows of decreasing c2c. 8. Working with 2 strands of Sugar Snap make four rows of decreasing c2c. 9. Working with 1 strand of Sugar Snap and 1 strand of Mellow Yellow, make four rows of decreasing c2c. 10. 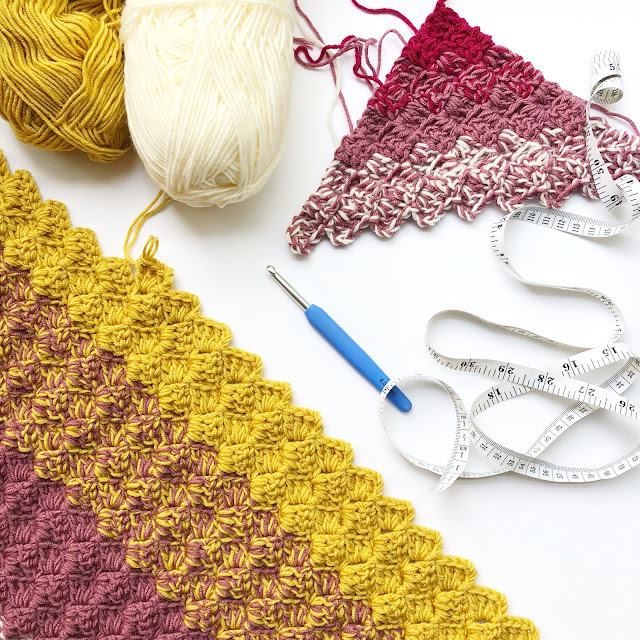 Working with 2 strands of Mellow Yellow, make four rows of decreasing c2c. 1. Working with 2 strands of Single Cream, make four rows of increasing c2c. 2. 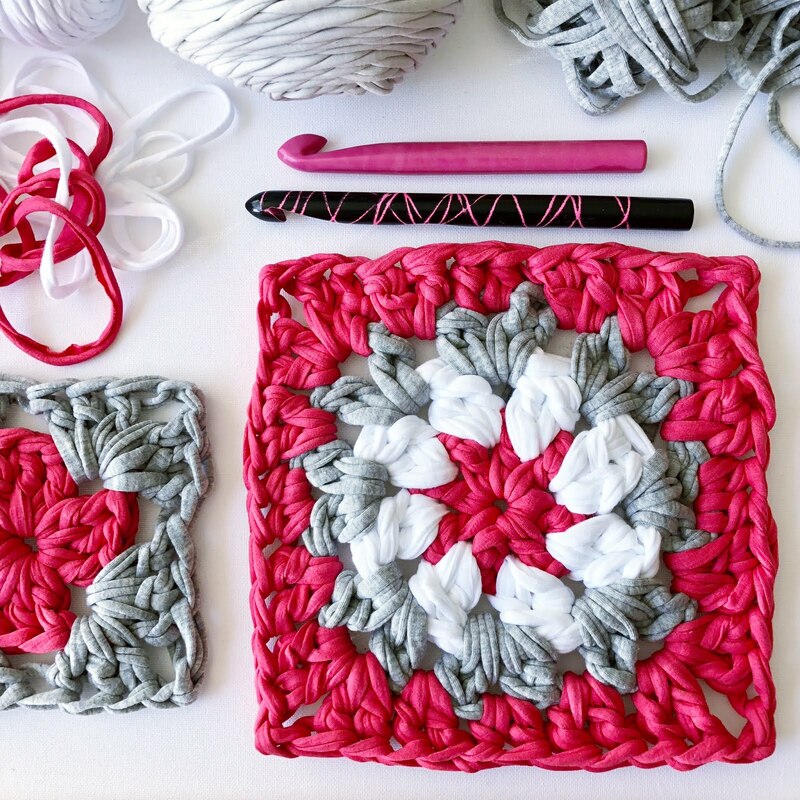 Working with 1 strand of Single Cream and 1 strand of Ash Rose, make four rows of increasing c2c. 3. Working with 2 strands of Ash Rose make four rows of increasing c2c. 4. Working with 1 strand of Ash Rose and 1 strand of Mellow Yellow, make four rows of increasing c2c. 5. Working with 2 strands of Mellow Yellow make three rows of increasing c2c. 6. Working with 2 strands of Mellow Yellow make two rows of decreasing c2c. 7.. Working with 1 strand of Mellow Yellow and 1 strand of Sugar Snap, make four rows of decreasing c2c. 9. Working with 1 strand of Sugar Snap and 1 strand of Rio Red, make four rows of decreasing c2c. 10. Working with 2 strands of Rio Red, make four rows of decreasing c2c. 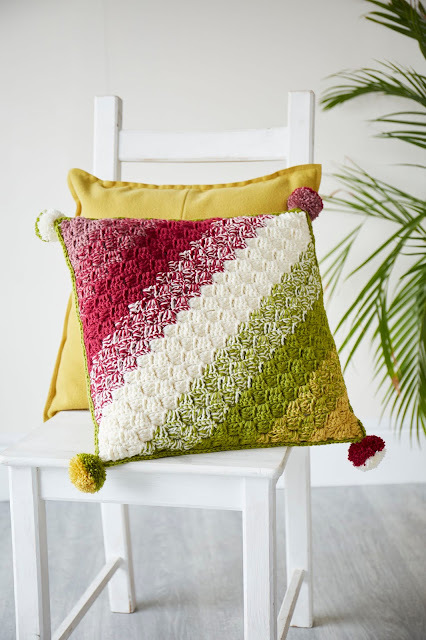 With WS of cushions facing and working with 2 strands of Sugar Snap, make 1dc around the edges, and 1dc, 2ch, 1dc in each corner. 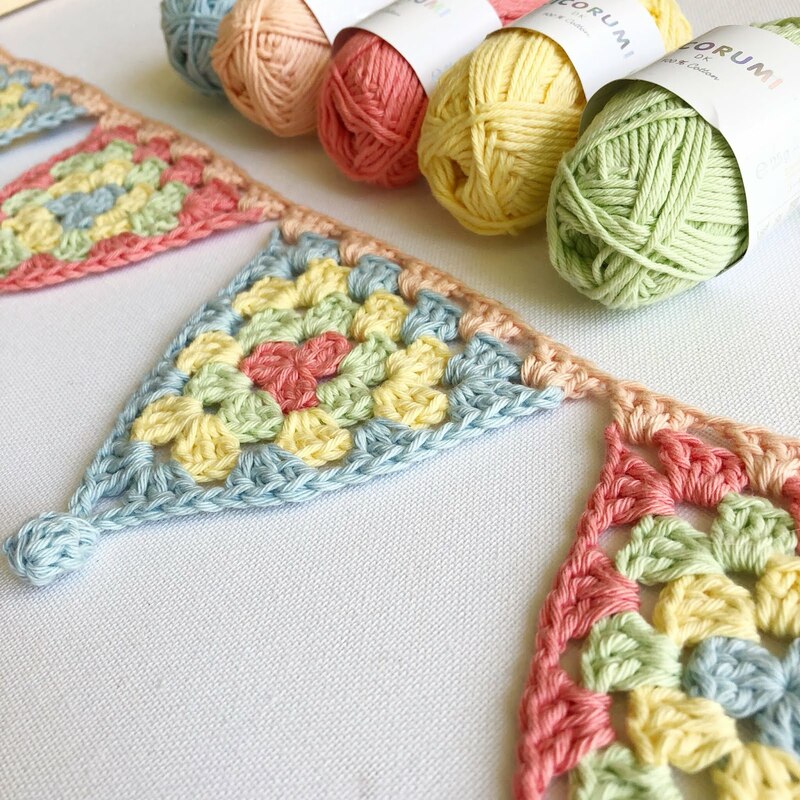 Make pompoms with your remaining yarn and attach to the corners! Row 1: 6ch, 1tr in 4th ch from hook, 1tr in each of next two ch, turn. Row 2: 6ch, 1tr in 4th ch from hook, 1tr in each of next two ch, sl st into 3ch, 3ch, 3tr in 3ch-sp, turn. Row 3: 6ch, 1tr in 4th ch from hook, 1tr in each of next two ch, *sl st into 3ch-sp, 3ch, 3tr in 3ch-sp; rep from * across row, turn. Rows 4 onwards: Repeat row 3. At the end of the row, do not 6ch, but sl st across each of the 3tr you have just made. 3ch, 3tr in 3ch of block just completed, *sl st into 3ch-sp, 3ch, 3tr in 3ch-sp; rep from * across row, turn. 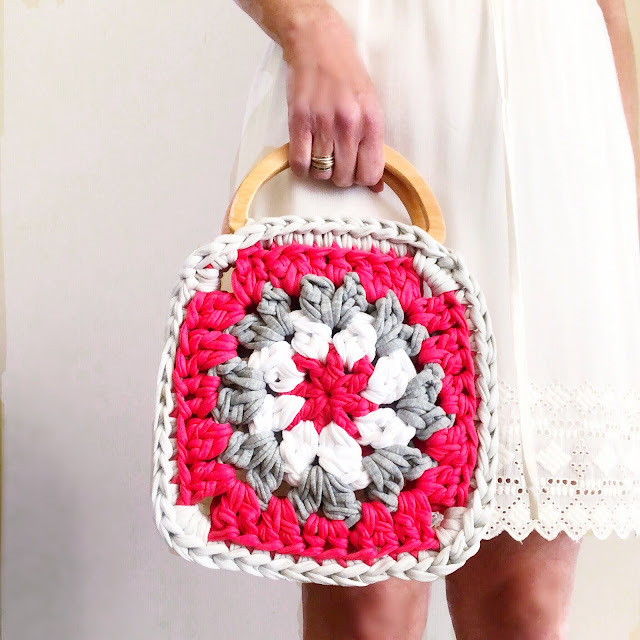 For a brilliant YouTube Tutorial see Bella Coco's here. Hope you enjoy making the cushion! 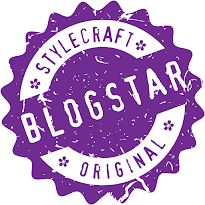 Find the complete list of blogstars taking part here and make sure you check out Kathryn at Crafternoon Treats' blog tomorrow for her day of the tour. And of course, here's the link for the giveaway - it's live from 10am GMT today (9th Oct) until 10am tomorrow!! 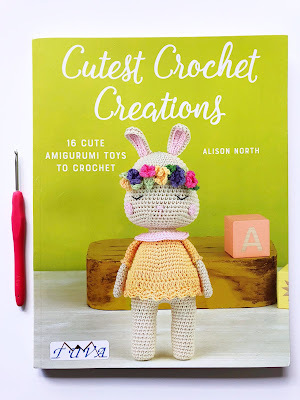 Cutest Crochet Creations - A book review and GIVEAWAY!! But you won't hear me complaining. This is the second book I've been lucky enough to receive to review - and I must tell you, it's a cracker!! Alison North is someone I've known for aaaaaages on Instagram, under her name of @KornflakeStew and she is an amazingly talented amigurumi designer. For the last few years, her sweet little creations have been flying off her hook and into her Etsy shop but now, you can find a whole new selection of cute characters in her new book, 'Cutest Crochet Creations'. 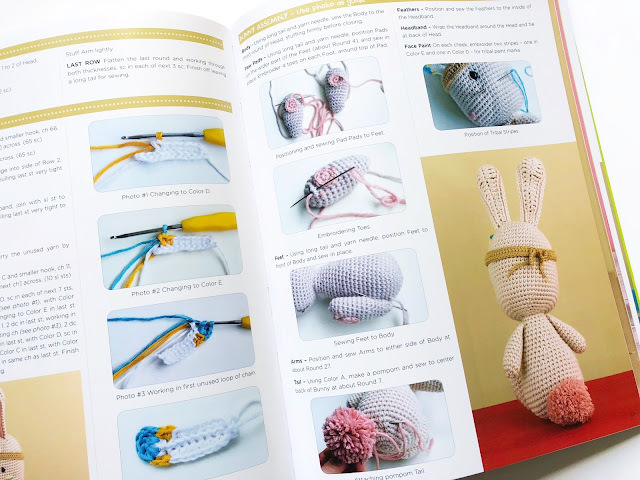 The first section covers everything you'll need - materials, yarn and accessories - and then describes all the basic stitches with illustrations to help. 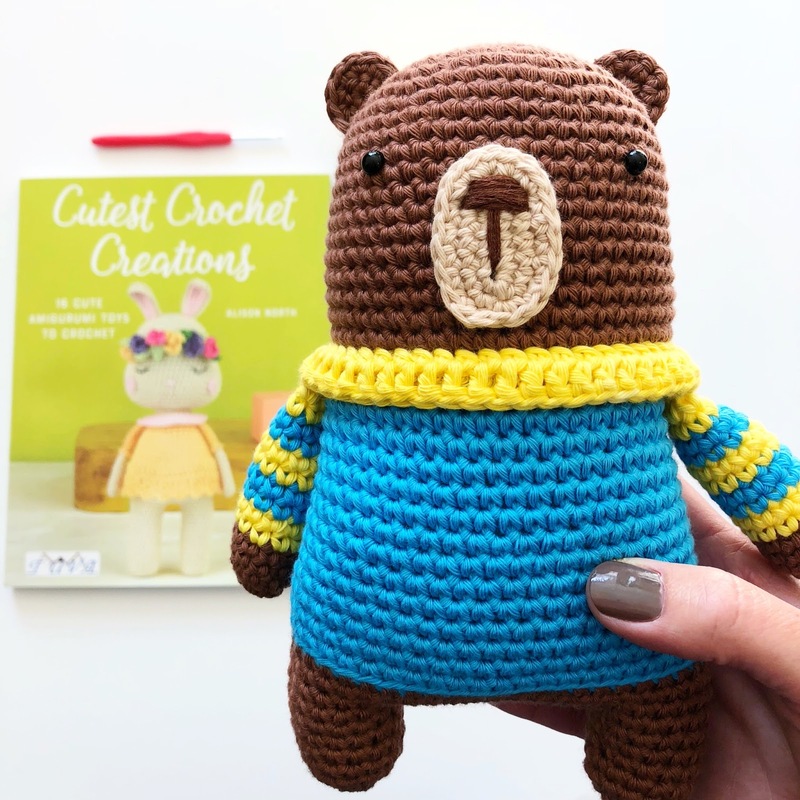 Alison then shares her crochet tips for amigurumi-making; everything from changing colours to fitting safety eyes and assembling the pieces together. Again, helpful photos guide the reader. 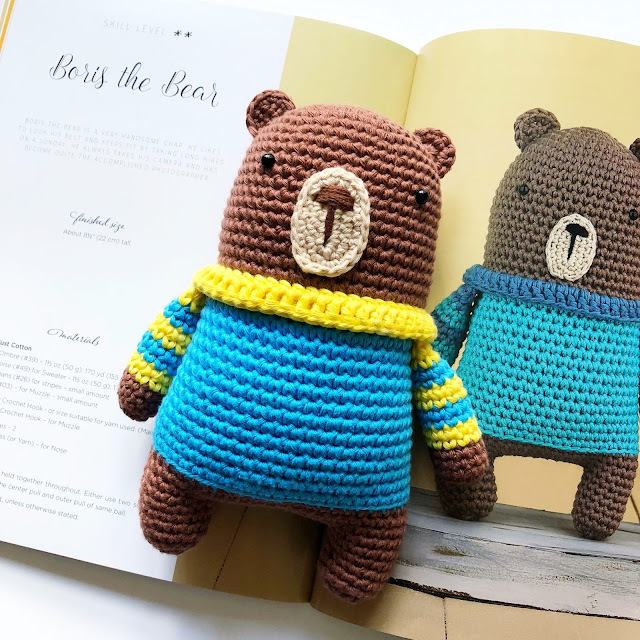 And then there are 16 original patterns - all of them equally ADORABLE!!! 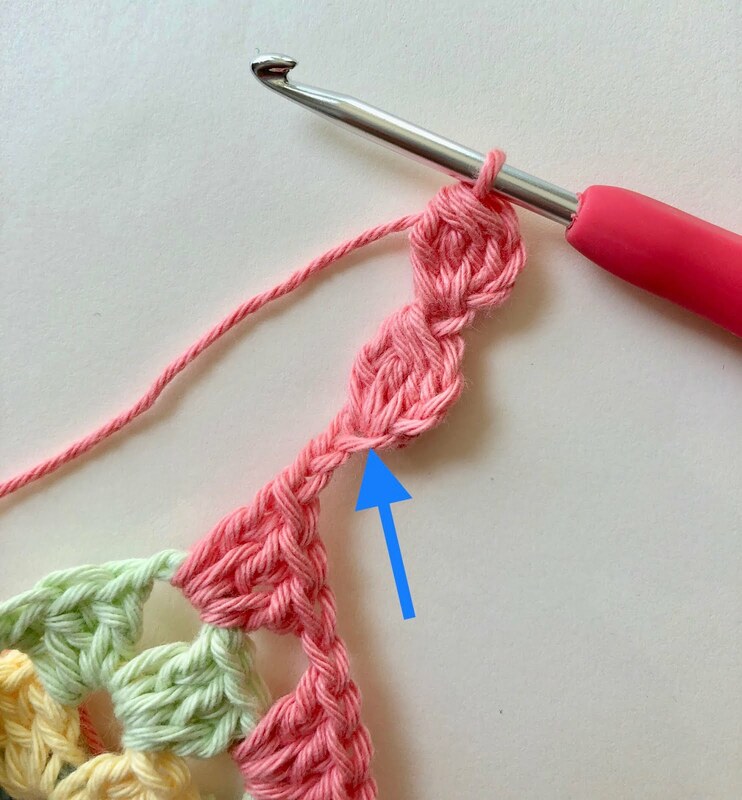 I found the pattern easy to follow - the instructions are written in US terms, but this is easy to get used to and it didn't pose a problem at all. I liked how there were close-up photos to show me where parts should be positioned, or how to make certain stitches and I found the instructions for assembly very well-explained. Congratulations, Alison - it's a fabulous book! Alison has kindly sent me an extra book to GIVEAWAY!!! All you have to do is enter below and a winner will be drawn at random on the 29th September 2018. Open worldwide. 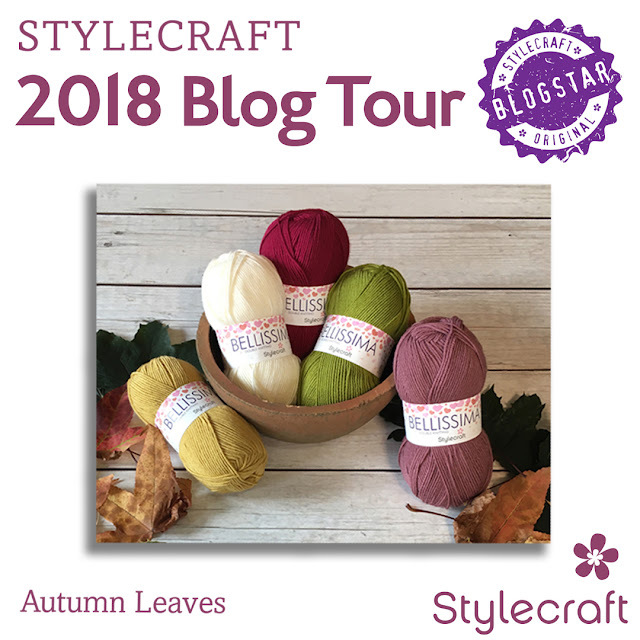 As a part of the Blog Tour with TUVA publishing, I received a copy of Alison North's book to review and a copy to giveaway. All views this blog post are my own. 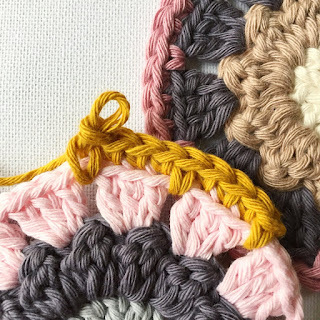 Shelly Husband is no stranger to the humble granny square. In fact, she's something of a granny-meister (if such a thing were to exist). Over the last few years, Shelley has taken this most traditional of crochet motifs and designed hundreds of beautiful versions - publishing them for free and in book collections. Her latest book, 'Granny Square Flair' is different in that not only is this her first ever print version, but all the designs are created using neutral, cream yarn. Shelly wanted her readers to be able to add their own colourways to their motifs and create truly personal projects. That said, her love of colour still pervades throughout, as she cleverly asked fellow crocheters to take a square and make it using yarns and colours of their choices. Which is how I became involved - but more on that later. 'Granny Square Flair' (written in US and UK terms) features 50 patterns, varying in difficulty and complexity and is intended for a crocheter with basic skills. 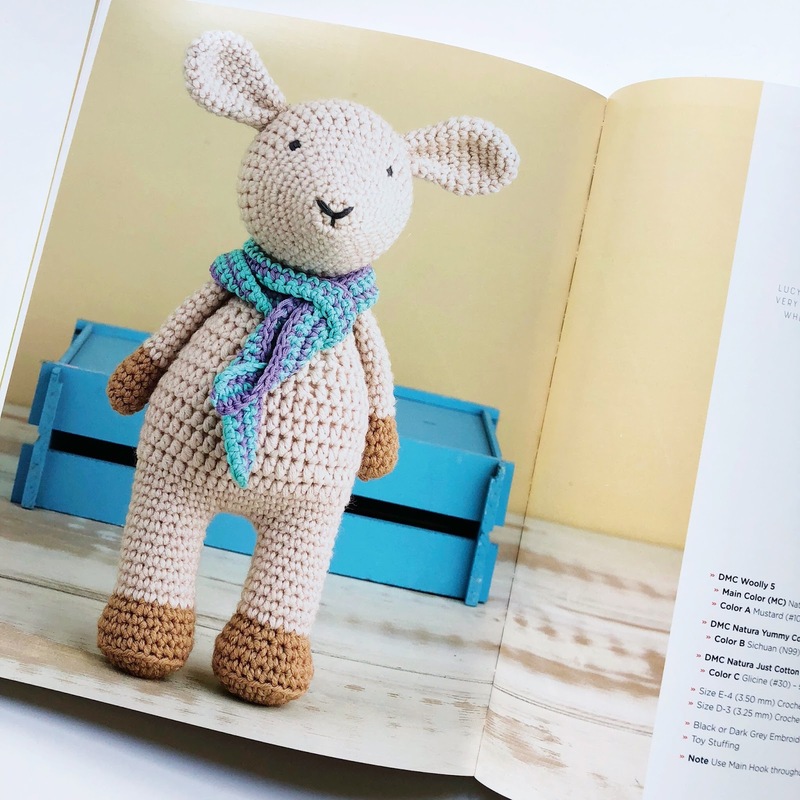 The beginning of the book includes everything you need to know to get started; information on choosing hooks, yarns and colours, how to read patterns and charts and a brilliant tip for creating seamless crochet! The next section contains the patterns. 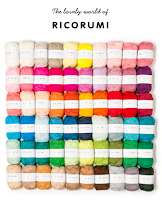 Each one has a difficulty rating and a guide to how much yarn it will use. There is a photograph of the square and a chart underneath (very helpful for the visual learners out there). Alongside are the written instructions, which are clearly described and easy to follow. At the bottom of the page are the coloured versions of the squares; either made by Shelley herself or by the group of crochet friends she asked to help. These include Dedri Uys, Julie Harrison, Mandy O'Sullivan, Marianne Dekkers-Roos, Sandra Eng and many more - oh and me, too! I chose the 'Bloem' pattern (p.64) to work on and decided straight away that I would supersize mine using Stylecraft Special XL in Cream, Duck Egg, Sage, Petrol and Graphite. And wowsers!! It worked out brilliantly! 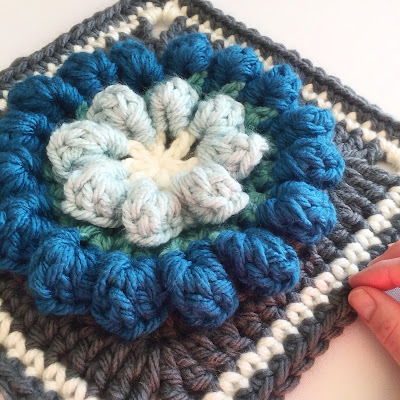 It would make THE perfect blanket and with squares this big, would be a pretty quick project too. 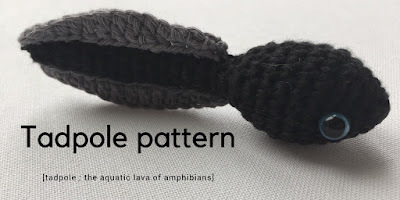 I found the pattern easy to follow and had no difficulty understanding the instructions. It's rather nice, isn't it?! 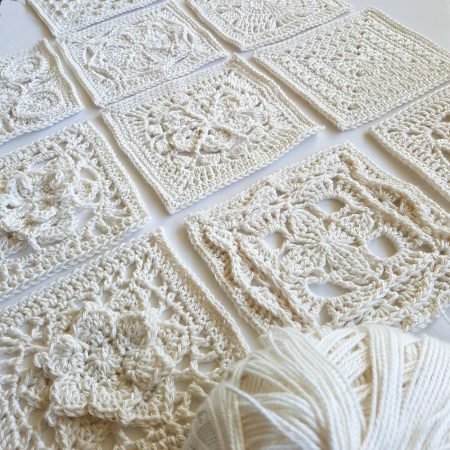 After the patterns, you can find the project section, where Shelley has 11 new designs to make with the motifs. 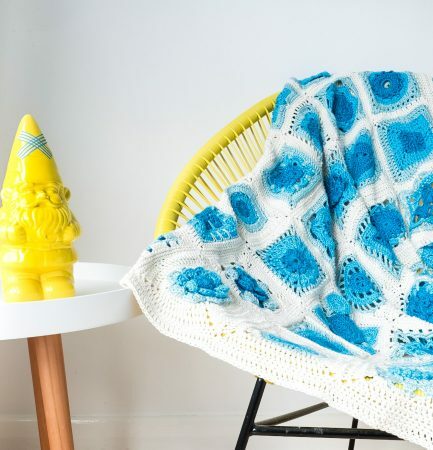 There are blankets and wraps, cushions and coasters - a great selection of stylish and modern pieces and there are tips and advice for designing your own projects, including how to choose patterns and layout and how to calculate the amount of yarn you will need. 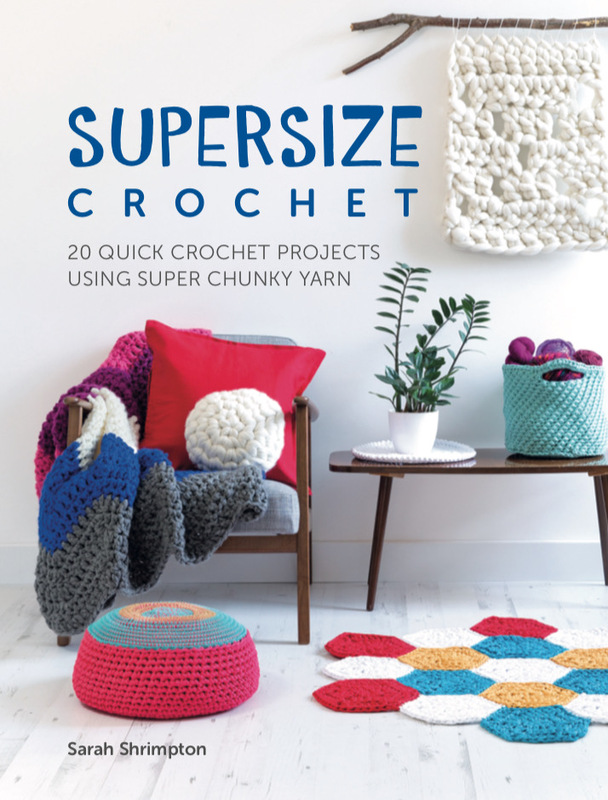 And so, I would like to congratulate Shelley on a truly fabulous book - her fresh, modern designs will inspire many crocheters to make their own beautiful creations. You can find 'Granny Square Flair' here (UK) or here (US). Shelley's website, with details of all her other books is here. 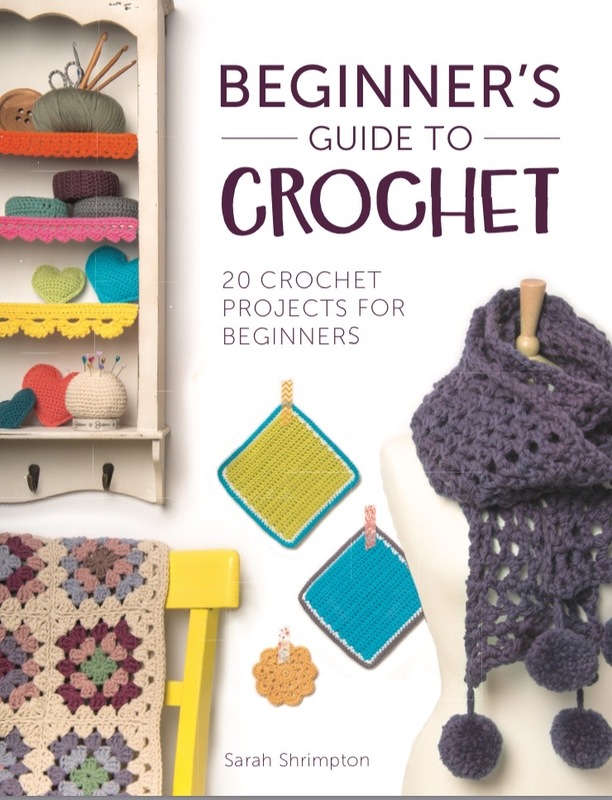 As a thank you for being part of Shelley's Crochet team, I received a copy of her book to review. 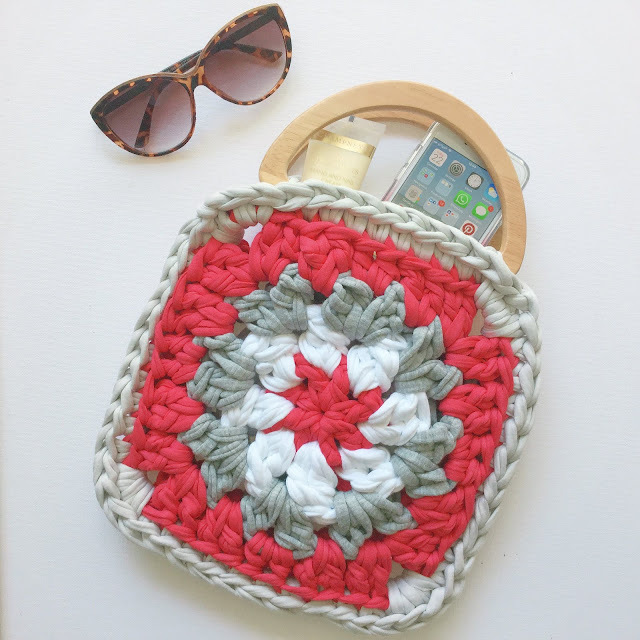 It's the perfect small project for using up all those odds and ends of yarn - hooray!! (For US, dc is the same as sc and dc2tog is the same as sc2tog). 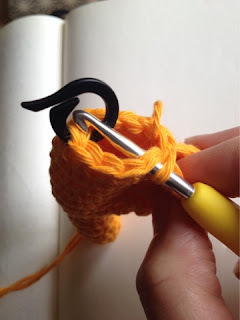 Insert hook into the front loop of the first stitch. Insert hook into the front loop of the second stitch (3 loops on hook). 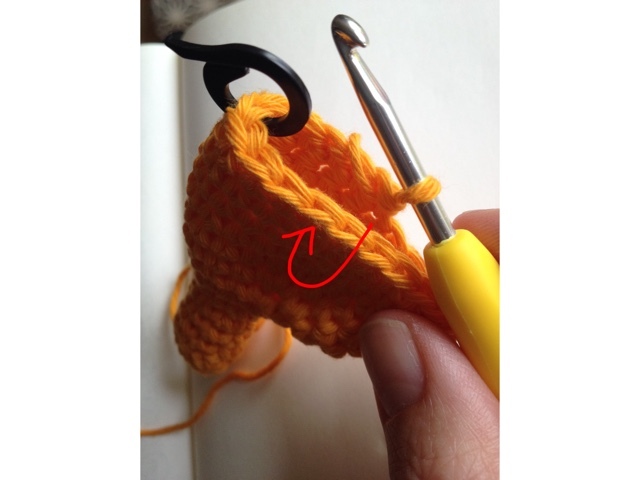 Yarn over and pull yarn through the first two loops (2 loops on hook). Yarn over and pull through both loops. Rnds 3 - 4: 1dc in each st around. Rnds 6 - 8: 1dc in each st around. Fasten off and sew closed. Ch 6, join with sl st to first ch. Rnds 2 - 5: 1dc in each st.
Rnds 10 - 13: 1dc in each st.
Rnd 15: dc2tog around. (5 sts). Rnd 15a: dc2tog around. (5 sts). Stitch between the legs to close the hole. Make a knot in the yarn and stitch it into place. Separate the strands to create the tail. Make a chain long enough to fit around the muzzle and join with sl st. Make another chain to fit around back of head and join with sl st to other side. Stitch in place. Add tassels of yarn to tips of ears and sides of muzzle. Add pompoms or any other decorations you like. 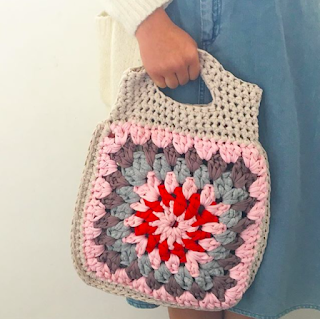 I cannot take any credit for the idea behind this bag - you see my good friend, Sharna made one and shared it on Instagram and I loved it. A quick search through my stash at home revealed lots of odds and ends of t-shirt yarn and a deeper dig unearthed some wooden bag handles, too. And so, inspired by her totally marvellous idea, I decided to come up with my own original design pretty much completely copy it. Now put the other square, with WS facing the WS of the piece you are working on. Make 1dc in the same 2ch-sp and the corresponding 2ch-sp of the square behind, then work your way around the two pieces, joining them by working 1dc BLO of front square to join FLO of back square. Make 3dc in the 2ch-sp space and repeat around, making 1dc in the first 2ch sp where you started. Now you will just work across the back square. Make 2dc in the same 2ch-sp, 1dc FLO in each st over handle, 2dc in 1ch-sp. (Or if you're really lazy like me, tie the ends in a knot on the inside of the bag and snip them. Enjoy your bag - it really is the perfect summer accessory! Now put the other square, with WS facing the WS of the piece you are working on. Make 1sc in the same 2ch-sp and the corresponding 2ch-sp of the square behind, then work your way around the two pieces, joining them by working 1sc BLO of front square to join FLO of back square. Make 3sc in the 2ch-sp space and repeat around, making 1sc in the first 2ch sp where you started. Now you will just work across the back square. Make 2sc in the same 2ch-sp, 1sc FLO in each st over handle, 2sc in 1ch-sp. The perfect way to brighten up a mantlepiece, hang across the garden or adorn an otherwise plain wall. 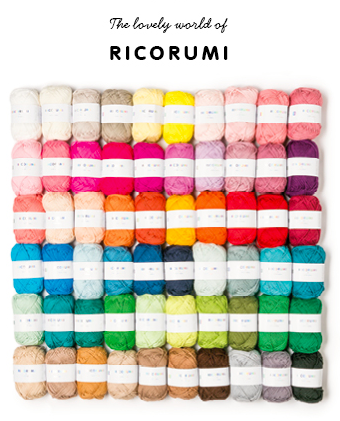 Recently, I was sent a beautiful set of these Ricorumi cotton DK yarns to try. At just 25g each, they are designed especially for crocheting small Amigurumi and I thought they'd be brilliant for my bunting. 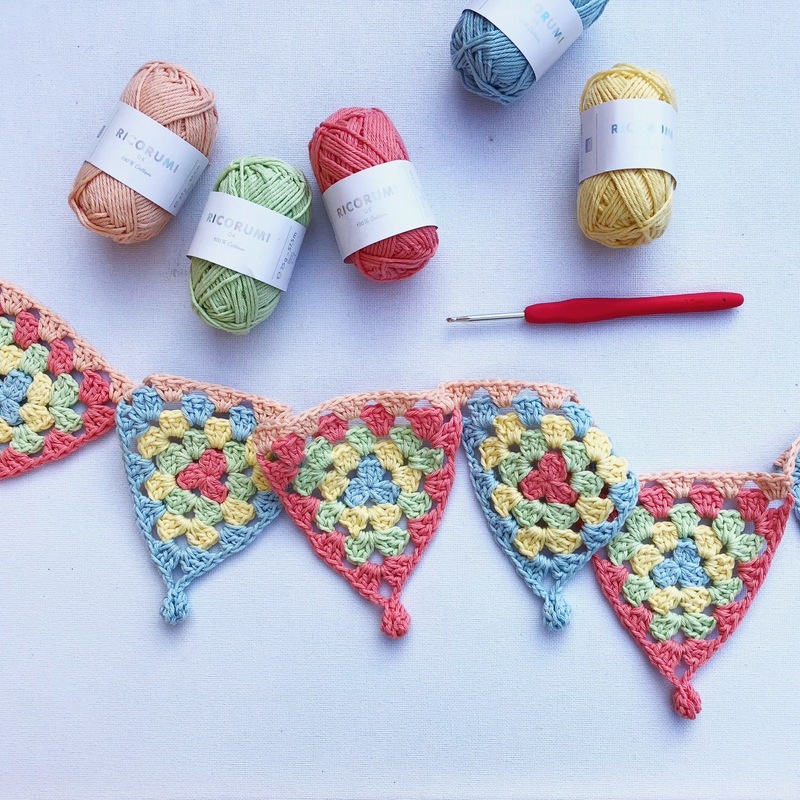 And so I've created* an easy peasy pattern which uses some of the pretty, summery colours available. 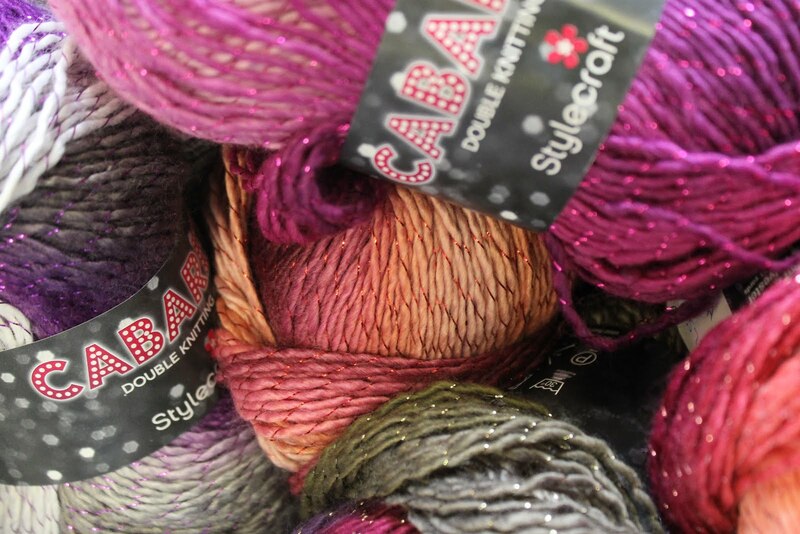 You could any yarn you like for this - it would be a great stash-busting project. 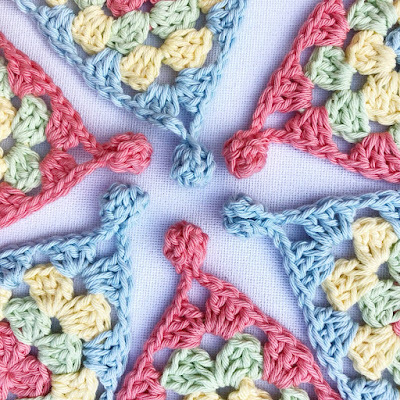 *I say 'created, but really this pattern is based on a traditional Granny Triangle pattern, which you can find everywhere. I just decided to add a dangly-bit. To make it pretty. Rnd 1: 2tr in 4th ch from hook, 3ch, [3tr, 3ch] twice. Join with sl st to 4th ch. Rnd 2: in any 3ch-sp, 3ch (counts as tr throughout) 2tr, 3ch, 3tr, 1ch in same sp, *[3tr, 3ch, 3tr, 1ch] in next 3ch-sp; repeat from * twice. Join with sl st to 3rd ch. Rnd 3: in any 3ch-sp, [3ch, 2tr, 3ch, 3tr, 1ch] in same sp, [3tr, 1ch] in next 1ch-sp, *[3tr, 3ch, 3tr, 1ch] in next 3ch-sp, [3tr, 1ch] in next 1ch-sp; repeat from * twice. Join with sl st to 3rd ch. Rnd 4: in any 3ch-sp, [3ch, 2tr, 3ch, 3tr, 1ch] in same sp, (3tr, 1ch in next 1ch-sp) twice, [3tr, 2ch, pompom, 2ch, 3tr, 1ch] in next 3ch-sp, (3tr, 1ch in next 1ch-sp) twice, [3tr, 3ch, 3tr] in next 3ch-sp, (3tr, 1ch in next 1ch-sp) twice. Join with sl st to 3rd ch. 20ch at beginning for hanging loop, then make [3tr, 1ch] in each 1ch-sp. When joining the next triangle, omit the 1ch. Rnd 1: 2tr in 4th ch from hook, 3ch, [3dc, 3ch] twice. Join with sl st to 4th ch. Rnd 2: in any 3ch-sp, 3ch (counts as dc throughout) 2dc, 3ch, 3dc, 1ch in same sp, *[3dc, 3ch, 3dc, 1ch] in next 3ch-sp; repeat from * twice. Join with sl st to 3rd ch. Rnd 3: in any 3ch-sp, [3ch, 2dc, 3ch, 3dc, 1ch] in same sp, [3dc, 1ch] in next 1ch-sp, *[3dc, 3ch, 3dc, 1ch] in next 3ch-sp, [3dc, 1ch] in next 1ch-sp; repeat from * twice. Join with sl st to 3rd ch. Rnd 4: in any 3ch-sp, [3ch, 2dc, 3ch, 3dc, 1ch] in same sp, (3dc, 1ch in next 1ch-sp) twice, [3dc, 2ch, pompom, 2ch, 3dc, 1ch] in next 3ch-sp, (3dc, 1ch in next 1ch-sp) twice, [3dc, 3ch, 3dc] in next 3ch-sp, (3dc, 1ch in next 1ch-sp) twice. Join with sl st to 3rd ch. 20ch at beginning for hanging loop, then make [3dc, 1ch] in each 1ch-sp. When joining the next triangle, omit the 1ch. And that's it. 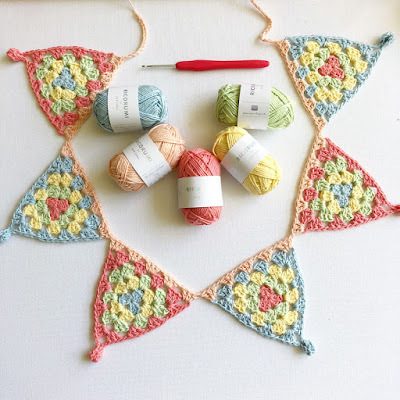 It goes without saying that you can keep adding triangles until your bunting measures the length you desire. And if, like me, you REALLY want to annoy your other half, just keep making more and more and more to festoon every corner of your home. Just recently, I was asked by Veronika Cromwell of The Blue Star Crochet Company whether I'd like another a shawl for my shawlf (my shawl-shelf). If you're a regular reader, then you'll know that my shawlf is pretty jam-packed with all the shawls, cowls, wraps and various neck-attire you could possibly imagine because I just love to make them and so obviously, I couldn't say no. Veronika is the designer behind The Blue Star Crochet Company and a quick peek at her Etsy shop reveals a plethora of beautiful patterns for accessories and garments. Now, the next big thing Veronika is launching is not just a pattern for her gorgeous Caught By The Sea Shawl, but the whole kit - everything you need to make it and a a few little extras, too. 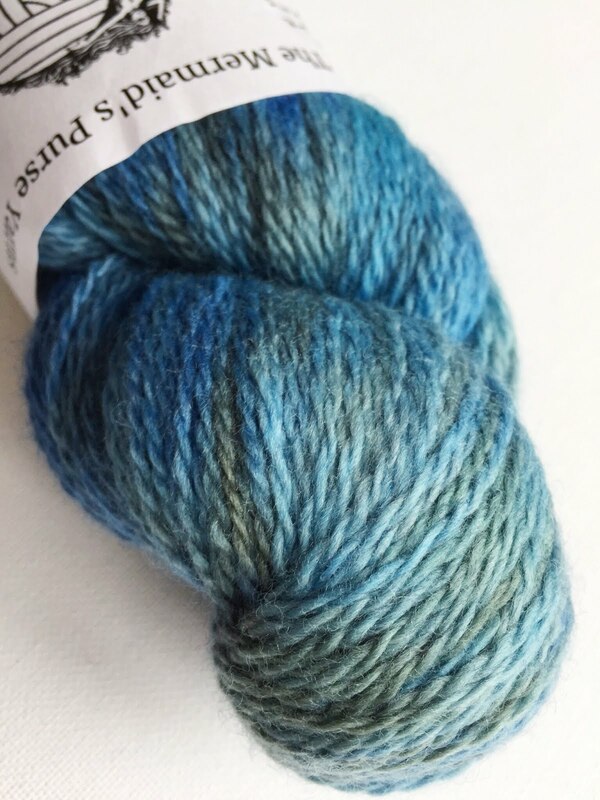 1 x 100g hand-dyed skein of 100% Falkland Merino British wool, with two colour ways to choose from, both dyed by Sheena Proudlock of The Mermaid's Purse and exclusive to this kit. The kit is available to pre-order from the 1st April 2018 (and all for just £21.99, plus postage). AND I have a discount code for you - just use the code ANNABOO1418 to receive 10% when you order your kit! 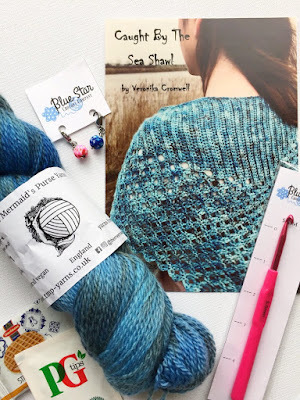 And so I'd like to say a big well done to Veronika - I think the kit is really superb and great quality and the pattern looks just lovely- it would make the perfect present for someone else, or special gift to yourself. I cannot wait to make a start on mine - that yarn is HEAVENLY. You see, a couple of weeks ago, we (not me, I hasten to add - this was something the Mister and kids are responsible for) picked up a teeny little bit of frogspawn from a muddy puddle in a field. 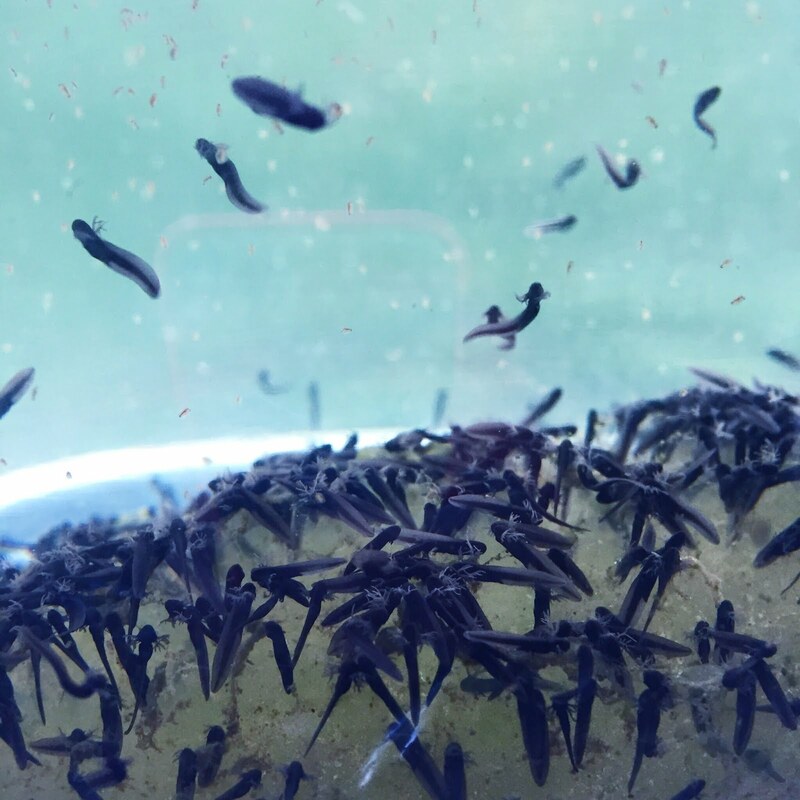 And now we have tadpoles. Eleventy-billion of them, to be precise. 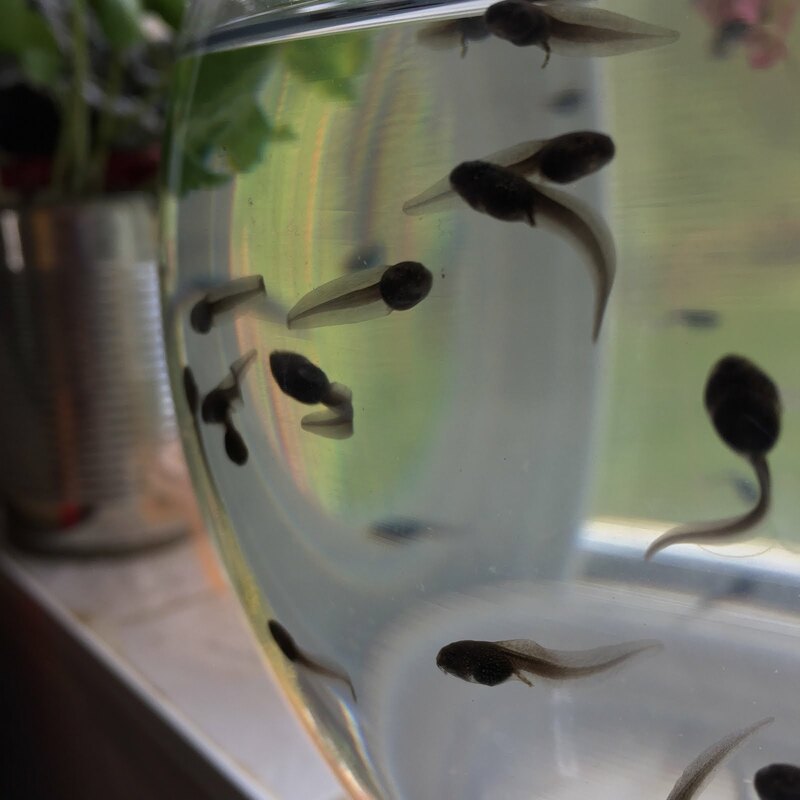 I'm even documenting their daily progress on my Instagram Stories (it's Day 28 of #frogwatch, if you're interested) which is proving very popular with my followers and I receive lots of comments from people telling me how much they enjoy tuning in each day to see how the tadpoles are getting on. 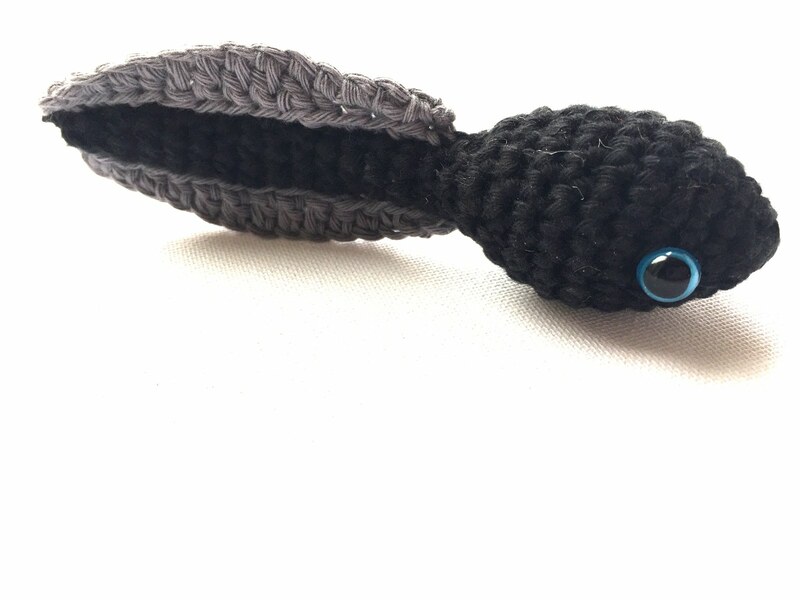 And so it seemed appropriate to crochet one. In fact, I'd like to make a whole set for every stage of their development, but we'll see. The tadpole is crocheted in continuous rounds. 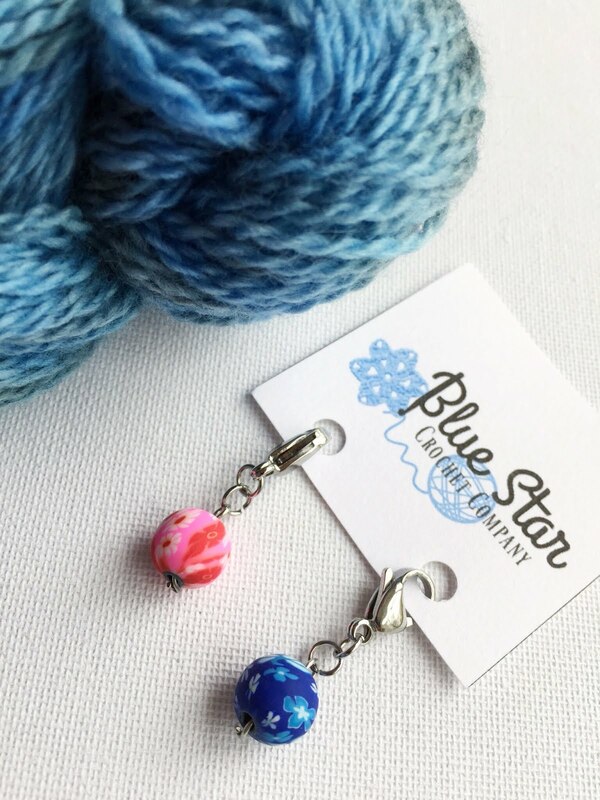 Use a stitch marker to mark the first stitch of every round. Stuff as you go. A small amount of yarn in black and grey and a hook to match. Rnd 2: 1dc in each st around. Rnd 4: 1dc in each st around. Rnds 6 - 9: 1dc in each st around. Insert eyes between rnds 4 - 5; 6 sts apart. Rnd 11: 1dc in each st around. Rnds 13 - 25: 1dc in each st around. Rnd 27: 2dc, leaving 1st unworked. 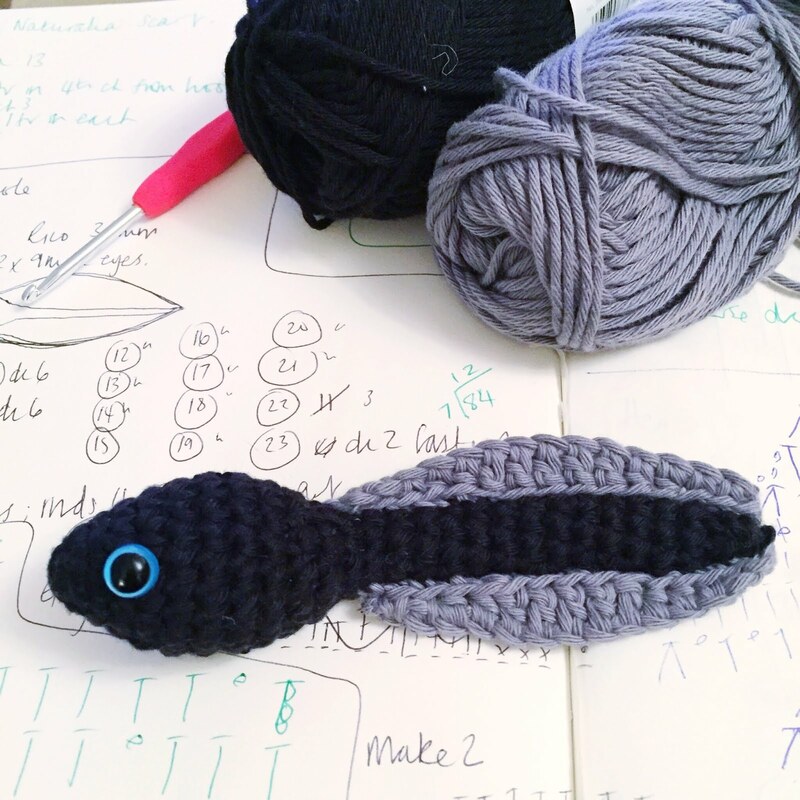 1sl st, 2dc, 2htr, 5tr, 2htr, 2dc, 1sl st.
Fasten off, leave long tail for sewing to tail. Using the yarn ends, stitch the tail fins in place. Rnd 2: 1sc in each st around. Rnd 4: 1sc in each st around. Rnds 6 - 9: 1sc in each st around. Rnd 11: 1sc in each st around. Rnds 13 - 25: 1sc in each st around. Rnd 27: 2sc, leaving 1st unworked. 1sl st, 2sc, 2hdc, 5dc, 2hdc, 2sc, 1sl st. The plan, of course is to watch them grow into froglets and release them back where they were found ... (before they take over the house like a Biblical plague).